A wild, inventive ride of a short story collection from a distinctive new American storyteller. 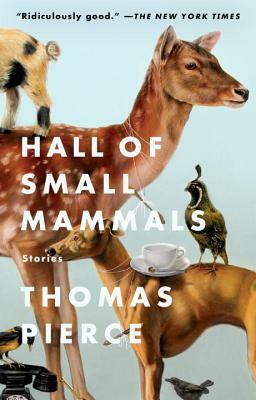 The stories in Thomas Pierce’s Hall of Small Mammals take place at the confluence of the commonplace and the cosmic, the intimate and the infinite. A fossil-hunter, a comedian, a hot- air balloon pilot, parents and children, believers and nonbelievers, the people in these stories are struggling to understand the absurdity and the magnitude of what it means to exist in a family, to exist in the world. In “Shirley Temple Three,” a mother must shoulder her son’s burden—a cloned and resurrected wooly mammoth who wreaks havoc on her house, sanity, and faith. In “The Real Alan Gass,” a physicist in search of a mysterious particle called the “daisy” spends her days with her boyfriend, Walker, and her nights with the husband who only exists in the world of her dreams, Alan Gass. Like the daisy particle itself—“forever locked in a curious state of existence and nonexistence, sliding back and forth between the two”—the stories in Thomas Pierce’s Hall of Small Mammals are exquisite, mysterious, and inextricably connected. From this enchanting primordial soup, Pierce’s voice emerges—a distinct and charming testament of the New South, melding contemporary concerns with their prehistoric roots to create a hilarious, deeply moving symphony of stories. Thomas Pierce was born and raised in South Carolina. His stories have appeared in The New Yorker, The Atlantic, Oxford American, and elsewhere. A recipient of the National Book Foundation’s 5 Under 35 award, he is a graduate of the University of Virginia creative writing program and lives in Virginia with his wife and daughter. "[C]ompulsively addictive and delightfully strange.... Pierce's menagerie of colorful characters equally inspires and amuses. The book is expertly paced (there isn't a dud in this eclectic bunch) and many of the stories' endings—some sinister, some melancholic, others heartfelt—prompt momentary reflection, though thankfully not always in ways that are expected." "Thomas Pierce describes a world we may soon inhabit, where science advances but mystery endures. Extinct species are revived on TV, and near-extinct species are the local zoo’s sellout draw; a new infectious disease defies attempts to identify or contain it, and physicists everywhere quest to identify a theoretical entity called the daisy particle. In this world, fractured families and lost souls — Pierce’s deeper interests — are the norm. Wry, wrenching, and elegant."